The Stag Beetle is equipped with two gearboxes, one that controls the right legs and one that controls the left legs. While working in the same direction, the gearboxes allow your robot to move forward or backward. While working in opposite directions, the gearboxes allow your robot to turn right or left. The remote control allows you to control the two gearboxes; each lever controls one gearbox. After some practice, you will be able to make your beetle go anywhere you want. The beetle’s legs are connected by plastic linkage rods that produce a six-legged walking gait when the motors are running. The mandible parts of the beetle’s head are linked to the right front leg, which causes them to open and close as the beetle walks. 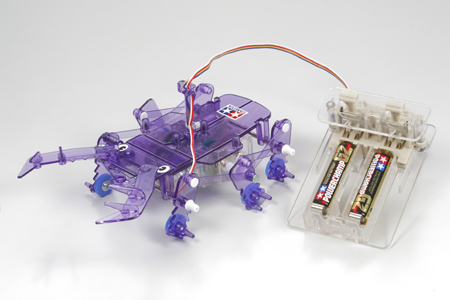 The Stag Beetle’s body is made from a transparent purple ABS resin that allows you to see all of the motors, gears, cranks, and linkage rods in action. If you have a Rhinoceros Beetle or another Stag Beetle, you can enjoy head-to-head games such as wrestling and soccer! The following video shows a Rhinoceros Beetle wrestling with a Stag Beetle: rhino_vs_stag.mpeg (7MB mpeg). Note: This is a kit. Assembly requires using a screwdriver and snapping parts together. No soldering is required. A screwdriver is included. Requires two AA (a.k.a. R6 or UM3) alkaline batteries (sold separately). Run on flat, smooth surfaces; avoid running over slopes, on bumpy roads, or on thick carpet.